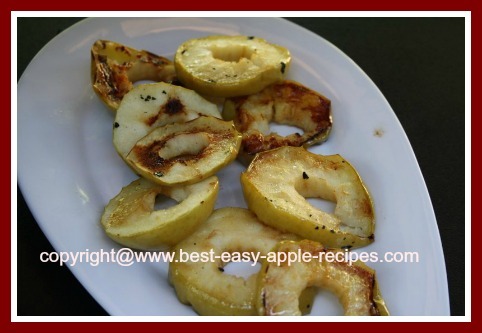 Grilled Apples are easy and FUN to prepare on the BBQ! If you are looking for simple instructions for how to prepare this fruit on the grill, you have come to the right place! 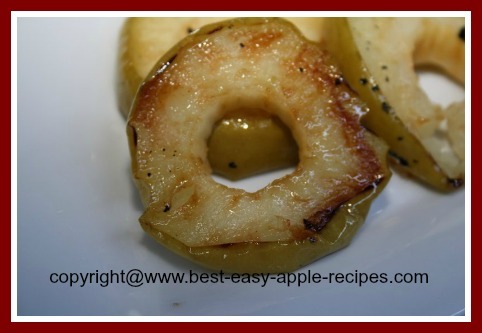 Grilled Apples are Such a Yummy Treat! 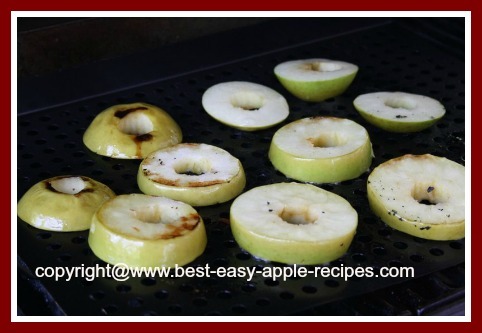 Here are easy, step-by-step instructions to prepare apples on the BBQ., including recipes for apple desserts prepared on the grill. Apples are a fruit that holds up well to barbequing. They can be grilled on their own, or in combination with other grilled fruit. 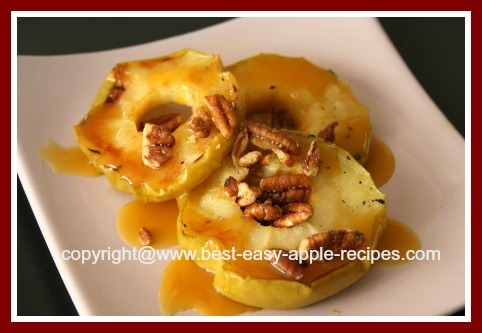 Grilling fruit is a splendid idea as a finale to any meal on the grill! Grilled apples are a favourite choice to accompany meats, especially pork. Apple and pork skewers are a great idea! Be sure to choose apples that are ripe, but not overripe. Most types of apples will work well grilling apples on the barbeque, especially those varieties of apples that are known to work well for baking. I like to use Granny Smith apples, but other types of apples provide equally successful results. The intense heat of the grill draws out and caramelizes the natural sugars in the apples, creating amazing taste. Apples can be grilled on their own, or paired with one or more other fruits on the grill. Prepare them for a snack or as an ultimate summer time dessert recipe. Wash and dry the apples if you are not peeling them. If desired, peel the apples. 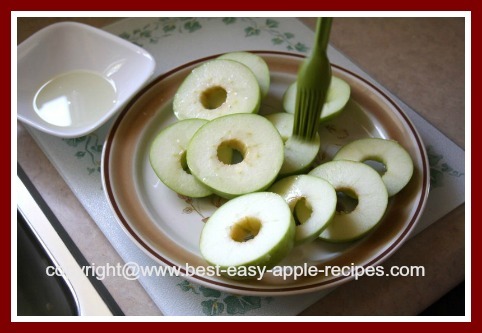 Cut apples into 1/2 inch thick slices or wedges or cut apples in halves. Toss the apple slices/wedges in melted butter to coat well, or spray or brush the apples with olive oil, canola oil, or another vegetable oil of your choice. (I often use olive oil in the special spray bottle I purchased; that way I use a natural product with spraying capabilities - see example at right). 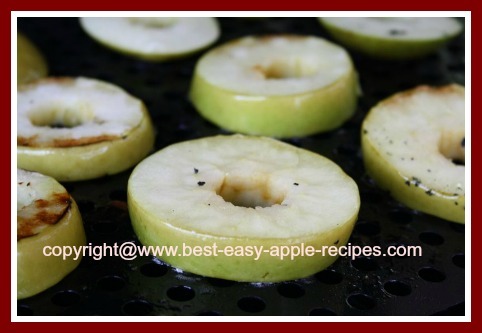 Using a perforated grill pan heat pan over direct medium heat for about 8 - 10 minutes for apple halves, and about 5 minutes for apple slices or wedges. This will serve to pre-heat the pan/grilling sheet. Add the apple slices/halves to the pan and grill them, with the lid closed as much as possible, until the apples are well browned and tender, about 8 to 10 minutes, turning a couple of times. Remove the apples from the heat. Serve plain, or with a dollop of ice cream, whipped cream, Greek Yogurt or drizzle with caramel sauce (I used store-purchased caramel sauce) and chopped pecans or nuts of your choice. If desired, spoon heated caramel sauce, or another sauce over the apples, gently tossing to coat. You can also grill the apples whole. To grill apples whole, core the apples to about 3/4 of the way down, (leaving the bottom part of the center still intact), and then stuff the center of the apples with brown sugar, and cinnamon, or whatever you choose. Grill whole apples over indirect medium-high heat until tender. Try the following grilled fruit recipes for your family and friends! Interested in learning how to grill all types of fruit?